Before twilight today I saw two of the coyotes in the group living in a small field bordering one of Los Angeles County’s concrete ‘rivers’. I saw Mom and Dad on May 25 and May 3 where Mom was clearly lactating. On April 21 I saw Dad with one of his year old daughters. Each of the coyotes today had two good ears. Since Mom has one cauliflower ear, the two coyotes today had to be either both of the year old daughters or one of the daughters accompanied by Dad. It has been more than a month since I last saw one of the daughters and I had wondered if they were still around and helping with Mom and Dad’s new puppies. It is clear from today’s sighting that at least one daughter is still here. I hope to be seeing the puppies in the next few weeks and am looking forward to learn how the daughters will share in childcare. I have been thinking about our Garber Park neighborhood and how it has changed over the past 25 years that we have lived here on Evergreen Lane. I have been thinking how habitat has altered since 1986 and how the overstory of greenery has declined. In 1986, Evergreen Lane was truly evergreen. In September of 1987, I recall that our neighbor, Mr. Garfield, a professor at Cal, described it as a “magic street.” At that time the street looked like a green tunnel, with big trees on both sides all the way down to Garber Park. A giant eucalyptus tree stood majestically at the intersection of Evergreen and Slater Lane. The air was cool and fresh, invigorating with the moisture of shaded land. For several years after we moved into our house, deer abounded. There were spots below our home where they rested during the day. When the heat became extreme in late summer, the deer found cool places to sleep under our house. 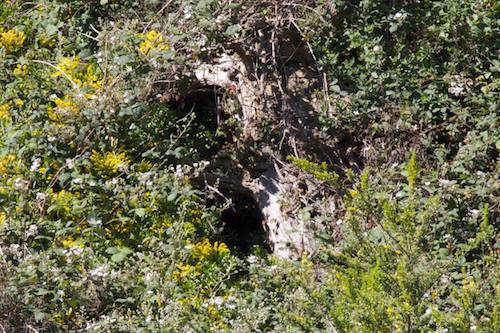 Often, in the fall, we would see male deer butting heads down the hill, while the does hid in the deeper tree growth. There were raptors perched in the oak trees and hawks flying across the skies. We would see bats fly by the windows at night. And, at certain times of the year, we would hear owls calling to each other in the dark as they waited to spy mice and other small night-time venturers. Every night, we would be greeted by a mother raccoon and three babies eager to hunt for crumbs that might have dropped from the picnic table on the deck. Mobs of robins arrived to find berries before they embarked on their migratory journeys. We enjoyed watching the abundance of spiders, tiny orange fellows that would spin their webs on plants in summer, adding dashes of color among the greenery. It was beautiful to watch them spin their slivery architecture; their webs were jewels that reflected the dappled sunlight. Wild bumble bees built a hive under the house, and yellow jackets would visit us when lunch was outdoors, snatching tiny bits of food from the tablecloth. We had a water snake living in our garden for several years. In the garden, we also hosted voles and, once in a while, we would spot the woodland pack rat, an intelligent, clean animal. Now, when we look around us, we see changes everywhere. Nature no longer seems as close as it used to be. When we look down at the arena where the bucks once battled, it is empty. It has been years since those scenes occurred. The path between houses here where we often saw three or four deer ambling down together is seldom used. We had one doe and a fawn visit last summer under the house, but they stayed for only a day, then disappeared. We spotted one deer resting down the hill this last year. We know fatalities have occurred due to heavier and faster traffic on Claremont Avenue; that may account for part of the loss. But we suspect that the deer may miss the trees and bushes that have been removed over the years. Careless pruning has opened up much of the green overstory that once existed. The raccoon population was bothering a neighbor so raccoon families were trapped and taken away as nuisances. Few have been our way since that time. This last year I counted only four or five cobwebs in the garden.The bumble bees have disappeared, as have the yellow jackets. Wild bees’ nests were destroyed by people who believe that bees’ nests house “dangerous pests.” Someone used a shovel to kill the water snake. Its body was left to rot in the sun. The robin activity was much lower this year. Perhaps they miss the berries; many of the berry bushes have been removed because they are said to be invasive; they are “not the right kind,” except that the robins really liked them. We read that rat poison is spread in parks discourage rodents. The poison moves up the food chain to destroy other species. We have never used pesticides or any other materials that would harm the abundant life that the park and the overhanging trees on Evergreen Lane once supported. Yet, the majority of the wildlife described above has disappeared. Granted, the 1991 fire (which thankfully did not reach Evergreen Lane or go into Garber Park) and construction in surrounding areas have occurred in the intervening years since we have taken up residence here. But the raptors are leaving us; a few hawks roam the area but lately I have seen or heard only one. Now, with more eucalyptus trees removed, the evening dance of the bats has also disappeared. We have no idea why so many animals, birds, and insects have left us. Something in the environment has removed what they needed. We don’t know what it is. We know we miss the spontaneous and vibrant natural environment that greeted us here in 1986. Now we are scrubbed and clean. The bothersome species have been banished. We miss the cool, scented evenings filled with moist, clean air. Dust is much more a part of our life now, seeping into our house through any crack or cranny, making us think twice before we throw open the sliders for fresh(?) air. With all respect to those who have come to restore Garber Park to its “native” beginnings and have worked hard to remove built up debris, we can’t help but long for that time when venturing into the Park was a near wilderness experience with dark, cool overhead coverings and the unexpected rush of an animal disturbed in its quiet retreat from the heat. I understand that the work that is going on in Garber Park is well intended… I also feel the magic slipping away. [Reprinted with permission from Spring issue of Hills Conservation Network’s newsletter and Save Mount Sutro. The same changes described in this article are taking place in too many of our Bay Area parks: Sutro Forest, Twin Peaks, McLaren Park, Mount Davidson, Glen Canyon. Ecological destruction, whether from building and traffic, or from native plant experiments in “restorations” inevitably impacts wildlife and atmosphere. Garber Park photo credit Bindu Frank]. Here is the look of a coyote fleeing, first dogs, and then a person. The coyote seemed to have a definite idea of where it was going when I first saw it. I followed far behind. Then, suddenly, the coyote stopped because, about 200 feet ahead, in its direct path, it could see dogs playing in an open area. The coyote observed for a few seconds, and then turned to go the other way, looking back a couple of times at the dog group to make sure it had not been seen. The dogs and owners did not see the coyote. The photos from the top row depict this situation. As the coyote headed back in the direction from which it had come, a lone walker appeared about 100 feet ahead on the path coming in the coyote’s direction. I was on this same path, so that now, the coyote was between two humans on the same path. 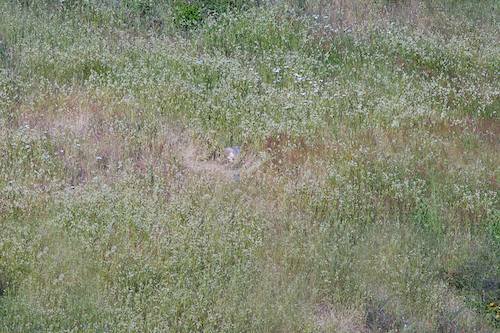 The coyote jumped off the path and into the tall grasses and continued 100 feet further away from the path. The coyote remained on rigid alert and ready to bolt as it and the lone walker eyed each other intently for a few seconds. The bottom row of photos shows the coyote in this situation. The coyote did not like the situation and bolted further off and out of sight. These are the most typical and common coyote reactions when a coyote inadvertently chances upon either dogs or humans in its path. The coyote does not want to encounter dogs or people — however, this sometimes just happens by chance as the coyote makes its rounds or moves to a different part of a park. If the dogs had seen the coyote, there very well could have been a reaction by the dogs. Unleashed dogs, of course, are freer to do as they please and don’t tend to make intelligent choices when wildlife is involved. Pupping season presents additional challenges for all concerned: a coyote feels much more territorial and protective during this time period, and we humans need to be more vigilant about keeping our and our dog’s distance and respecting a coyote’s needs. Before twilight today I saw both of the parent coyotes who live in a small field that borders one of Los Angeles County’s concrete ‘rivers’. The last time I saw them was May 3. I’ve yet to see their puppies this year. Dad is still looking a bit thin. I came across them both as I was leaving their field. Mom was partially in cover. I moved about twenty feet away from my leashed dog to get a less obscured picture of her. Seeing an opportunity, Dad quickly approached my dog Holtz. Dad disregarded Holtz’s barking and then charged. I snapped a quick picture and then moved to stand between him and Holtz. His opportunity blocked, Dad broke off his charge, moved back, calmed down and did some investigatory sniffing. Throughout the event, Mom stood at the ready. My read of Dad is that he would have stopped short of contact with Holtz regardless of my having blocked him. There is an element of bluff in Dad’s displays and he was aware that Holtz, for being constrained by leash, could not engage him and hence, a close approach was safe. The photographs included in this post illustrate how purposeful my coyotes can be when they have pups around. Note that upon seeing my coyotes in their field, I head for the exit at once. On the way out, I’ll stop in a clearing and take some photographs. At times they merely hide, other times they do as they did today. As mentioned in my post of May 3, Mom apparently has had her puppies this year. It isn’t clear to me if today Mom and Dad, upon seeing me from a distance, messaged their accompanying pups to stay hidden while they took action against the intruders. Instead, perhaps the two daughters from last year were babysitting so Mom and Dad could have some time off. 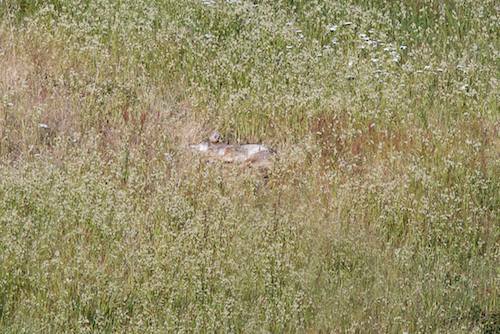 Most people never notice a coyote sleeping out in the open — after all, they blend in well with their surroundings, and, isn’t it just common sense that an animal would seek cover to sleep? But coyotes have their own way of doing things. They are, in fact, protected in ways that matter to them. They never rest anywhere close to a path which people or dogs might frequent. A coyote always picks a safe spot, “far from the madding crowd.” These photos were taken with a powerful zoom lens. There are rock and poison oak barriers that prevent access to most dogs and people who might enter the area. Dogs and people are coyotes’ only enemies in an urban setting. This coyote slept, but kept changing its position every so often, sticking it’s head up for a look around before sprawling out again to sleep. When dog activity in the distance pierced it’s quiet, the coyote sat up to watch sometimes, and ignored it at other times. Then, at a certain point, the coyote slowly got up, scratched itself, stretched, and wandered slowly over to a completely secluded spot under some bushes where he now could not be spotted at all. But, before moving on, two hours had elapsed sleeping in the open, in the sunshine. 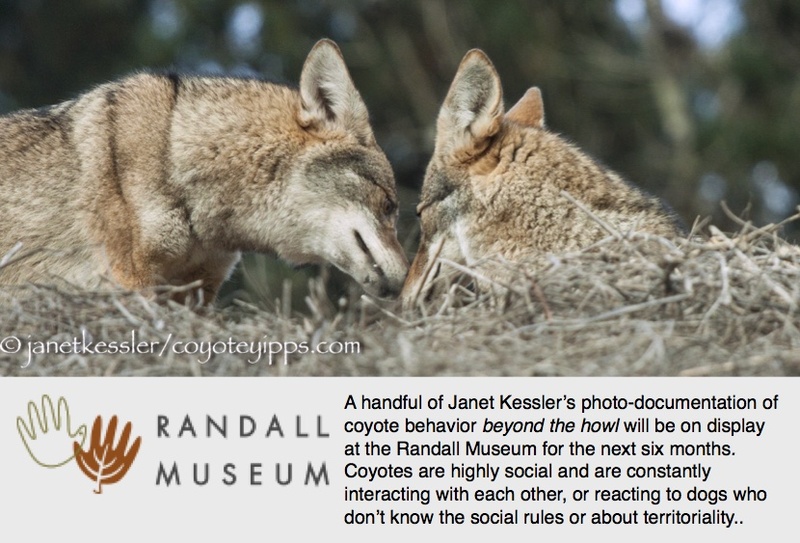 Here is a sequence of events that gets you right into a coyote’s world. I came down a path to find a coyote high on a rock, carefully watching some dogs and walkers approach. As the dogs and people reached a point where they might have spotted the coyote, the coyote hurried down the rock, waited for a moment and then hurried to behind a bush to hide and wait for the group to pass by — I was impressed with this little coyote’s intelligence and planning. Neither the people nor the dogs saw the coyote at all. After this group had passed, the coyote scrambled back up to the lookout on the rock, watching this group until they were totally out of sight. A huge yawn and stretch was in order to celebrate the successful evasion. But it was important now for the coyote to “speak its mind”. It trotted down to the path where the group had passed, smelled for the exact location to leave its mark, and pooped. Then it walked a little further, smelled another spot where the group had been and this time urinated on that spot. And that is precisely what this coyote thought of that group. The history behind this is that this particular group of dogs has continually chased this coyote, and one of the walkers has continually thrown stones at the coyote. So, yes, the coyote avoids them, but feels free to “speak its mind” about them — telling them off in its own way!